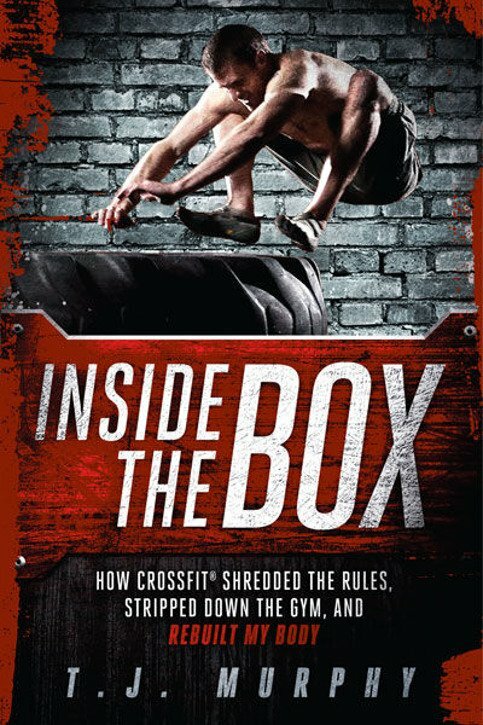 Inside The Box: How Crossfit Shredded the Rules, Stripped Down the Gym, and Rebuilt My Body. Jedna z pierwszych pozycji w całości poświęconych CrossFitowi. In Inside the Box, veteran journalist and marathoner T.J. Murphy goes all in to expose the gritty, high-intensity sport of CrossFit®. Murphy faced a future with a permanent limp from one too many marathons. Desperate to reclaim his fitness and strength, the 47-year-old signed up for his first CrossFit workout with nothing to lose. Anaerobically blasted by each workout of the day, Murphy discovered a sweat-soaked fitness revolution that’s transforming bodies and lives. CrossFit is the sport of fitness, a radical new approach to exercise that is turning the traditional gym workout upside down. Every day at thousands of CrossFit gyms across America, fitness seekers of all shapes and sizes flex their inner athlete by racing to finish fast-paced workouts. Each workout mixes weight lifting and gymnastics into an explosively effective and addictive new way to lose weight and carve out a new physique. Inside the Box is Murphy’s journey through CrossFit. From staggering newcomer to evangelist, Murphy finds out how it feels, why it’s so popular, whether it can fix his broken body.